We were told by our lovely Dreams on Air Retail Manager, Saina, that Joanne is pretty popular among their customers ! JOANNE is born when we were preparing for our very first collection, S/S18 'Gisaengs'. the women performing artists who inherited Korean traditional dances, songs, etc. To find more about Gisaengs, please go to our 'Catherine' posting uploaded on 31st January ! which you can tie around the top-line of the shoes. Tie them once and you can slide your feet in anytime, without the need for redoing. The signature quilting detail and tapings are done with an artisanship and great care. 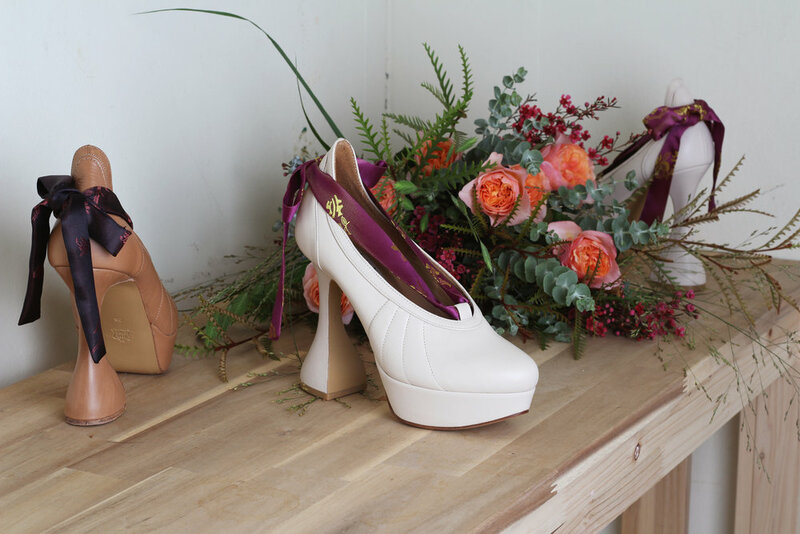 If you choose Ivory - you can either have purple with golden thread or bright green straps. JOANNE was first introduced in Camel colour only. they're 11.5cm high with 2.5cm platforms. Pretty high, but I can assure you they really are comfortable, comfortable enough to walk in all day. made from a suggestion from our friend. And we actually think they're looking great ! or even with a pair of jeans, as seen from our lookbook pictures. Bold but elegant, a pair of JOANNE can change the entire mood for your outfits.